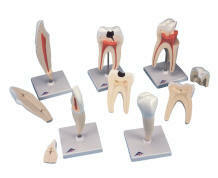 This 2-part model shows the upper incisor tooth with complete horizontal section cut in order to show pulp. Comes with removable base. 23 cm. 2 part upper triple-root molar with Longitudinal section of tooth crown and root to show pulp and the onset of cavities. Upper Triple-Root Molar with cavities on removable base. 23 cm. 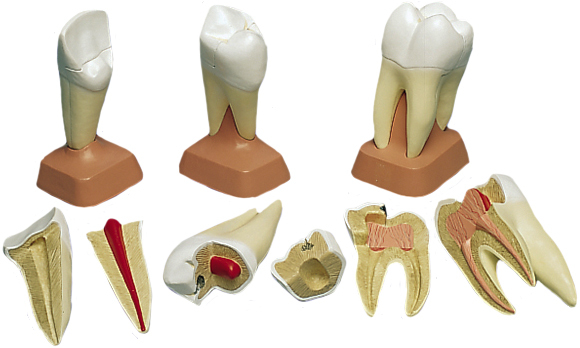 Ten times life-size, six teeth representative of every human tooth type are included in this series: (1) Lateral Incisor; (2) Canine (cuspid); (3) First Premolar (bicuspid) with advanced caries; (4) Second Premolar; (5) Detachable bridge, consisting of first Molar with gold crown; (6) Second Molar. Since it is nearly identical morphologically to the lateral incisor, the central incisor is not included, nor is the third molar, which is so similar to the second. 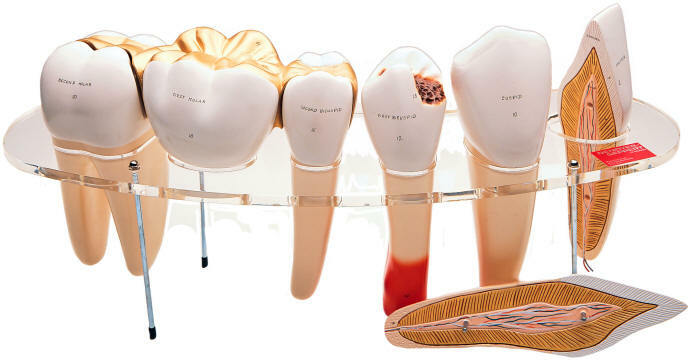 Each tooth has its name hand lettered on its surface, and is removable from the transparent base. 22 hand-coded features are identified in the accompanying key. 22x10x8 inches (56x25x20 cm) overall.